When a U.S. president decides to go big or go home by laying down his veto power, the country takes notice. Actually, take that back. During a few presidents' time in office, Americans probably stopped noticing after a while. Franklin Roosevelt used his veto power a whopping total of 635 times, and Grover Cleveland wasn't far behind — relatively — with 414 vetoes. Would get a little boring, don't you think? To now put this in perspective, President Obama used his veto power Thursday, and it was only the fifth time he has done so during his seven years in office. Because President Obama has never been one to use this power lightly (while it seems Roosevelt couldn't make it to Friday without tossing in a veto or two), his action today has us all asking what must be written on that paper to warrant the big bill send-back from Obama. His exercising of veto power this time around was in rejection of the National Defense Authorization Act. The bill would enable the creation of a military "slush fund" by allowing officials to tap into an overseas account and sidestep limitations on the military's budget. At a veto-signing ceremony in the Oval Office Thursday, the president said Washington should aim for a budget that "properly funds our national security." The president also took issue with another aspect of the bill, one that deals with Guantanamo Bay detention facility. Where Obama has said he would like to close the military prison before he leaves office and his administration has been gradually transferring prisoners to other facilities, the bill would restrict these transfers from happening. 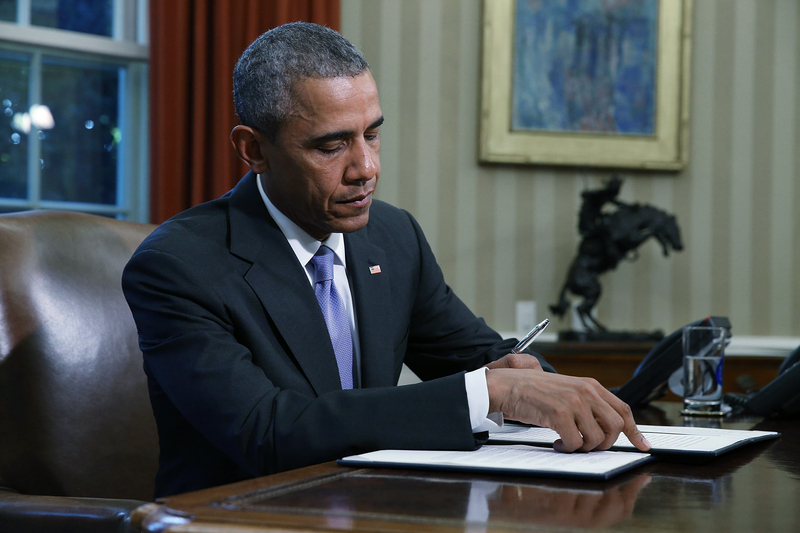 2015 has been a big year for Obama vetoes, however few they may be. In February, he rejected the bill that would have given the green light for construction of the Keystone XL crude oil pipeline, a project vehemently opposed by environment advocacy groups. A month later, he said no to a congressional resolution that would have overturned new rules that, "streamline[d] the voting process for folks who wanted to join a union," he said. In 2010, Obama also vetoed a bill that would have forced state and federal courts to recognize the legitimacy of documents notarized in other states. Though the content of the bill may not sound all that exciting now, Obama's reasoning behind the veto should be understood in context. The then-White House communications director said the president was exhibiting caution around changing notarization rules after reading reports that banks were forging documents to move home foreclosures forward. Obama's first veto happened back in 2009, and you could argue it wasn't even a really real veto. The rejected bill, which was a stopgap spending bill to ensure funds were available to keep the Defense Department running, was basically a duplicate of an appropriations bill that Obama had already signed off on. Obama still got to look like a boss, though, by calling the bill "unnecessary." Though Obama has displayed more restraint than some of his predecessors when it comes to sending back bills, the man knows when he sees one that just isn't up to par. And it's not like he is afraid to veto — just look at his recent threats to veto any bill that defunds Planned Parenthood. The president's words to Congress Thursday upon announcing he was vetoing the defense authorization bill? "My message to them is very simple: Let's do this right."